It's Christmas Eve and we are checking off last minute items from our to-do list in preparation for hosting Christmas for the first time at our house. Luckily, there's not much to do. Clean a few bathrooms, change the sheets, sweep and vacuum. Easy right? No matter if we are doing Christmas at our house or another family member's, we always make sure and keep one tradition going each and every year. We are big on movies in this family, have we mentioned that? There are some movies we go back to each year like The Holiday or Love Actually, but there's one we look forward to more than the others and have seen at least three million times. 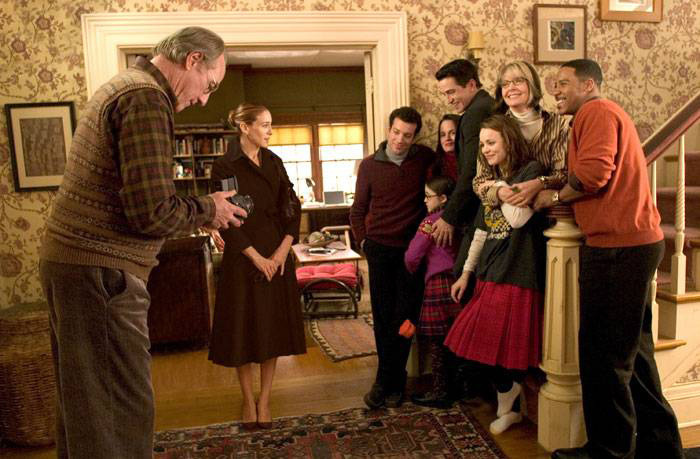 We watch The Family Stone every year on Christmas or Christmas Eve. Thomas and his family have done it for years even before us, but we have kept it going and it never gets old. Have you seen it? A lot of people are divided on it (for reasons unknown to us) but it's the perfect representation of what a big family is like when everyone gets together around the holidays. There are some fights, lots of hugs, tears, laughs, great food, deep discussions, and plenty of love. Not to mention THE HOUSE. Oh man, don't even get us started. It has to be our favorite movie house of all time. It's old, warm, inviting, cozy, cluttered, comfortable. It's done in browns and oranges, with tons of wallpaper (swoon) and old oriental rugs. It has been the biggest inspiration for us yet as far as movie houses go.